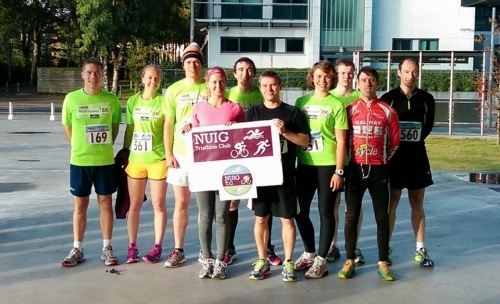 Sport has always been an integral part of life for the staff and students of NUI Galway. Over the years, the individual disciplines of swimming, cycling and running have been well catered for by their respective clubs. In September, the NUI Galway Triathlon Club was formed by Ciarán Walsh, a student and avid triathlete, with the overarching aim of bridging the sporting gap between the three disciplines, while adding a triathlon specific focal point for the staff, student and alumni community of NUI Galway. NUI Galway Triathlon Club caters for all skill levels, from the complete beginners right through to the seasoned athletes, by providing a friendly community for members to train, race and socialize. The club operates throughout the year by providing seasonal training options. The club recently held its first training triathlon in November, a super-sprint consisting of a 400 meter swim, a 10 kilometer cycle and finishing off with a 2.5 kilometer run, all held within the confines of the Kingfisher Gym. This was a great opportunity for club members to see all their hard work throughout the semester pay off. For many of our members it was actually their first ever triathlon and following on from this, the club hopes to run several more over the upcoming semester. Throughout the winter months, training consisted of mid-day runs, spinning classes and indoor swim sessions alongside the NUI Galway swimming club. These sessions are aimed at conditioning members for spring races and the triathlon season, which takes place over the summer. They also aim to prepare athletes for the 2015 triathlon and duathlon National Series. Unfortunately, it is impossible to cater to everyone, as lecture and work commitments can make attending all the sessions problematic. To help combat this, the club utilizes a free training aid called Strava, an app compatible with most smartphones and GPS watches, to help record, compare and motivate members to put in that extra effort while training. Alongside Strava, the club operates a Facebook group to help keep everyone up to date on any activities or events within the club. For more information on the Triathlon Club, check us out on the clubs website or call in to us on Clubs Day in the Kingfisher.